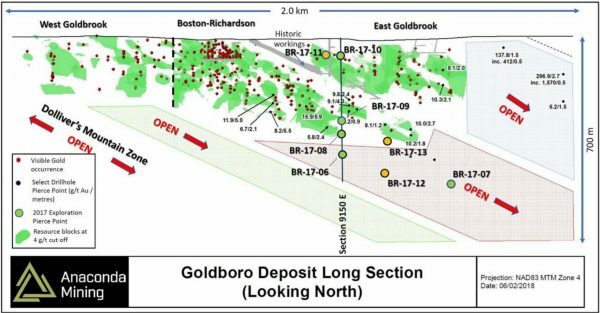 NOVA SCOTIA – Anaconda Mining of Toronto has filed an updated 43-101 report for the resources at its Goldboro gold project 175 km northeast of Halifax. The deposit is now thought to contain 3.8 million measured and indicated tonnes grading 4.96 g/t gold and containing 602,700 oz. The inferred estimate is 2.1 million tonnes grading 6.63 g/t and containing 453,200 oz. of gold. The company is completing the geotechnical, hydrogeological, baseline environment studies, and community and indigenous consultations. In the preliminary economic assessment done earlier this year, the Goldboro project has an after tax net present value (5% discount) of $88 million and an after tax internal rate of return of 29.3%. The anticipated pre-production capex is $47 million, and the project will pay for itself in 3.1 years. Over an 8.8-year mine life, Anaconda expects to produce a total of 375,000 oz. of gold at an all-in-sustaining cost of $797 per oz. (US$654 per oz.). The Goldboro project also has underground potential. Visit www.AnacondaMining.com to watch a virtual reality video of the project.